A delicious, cold treat for a hot Spring day! 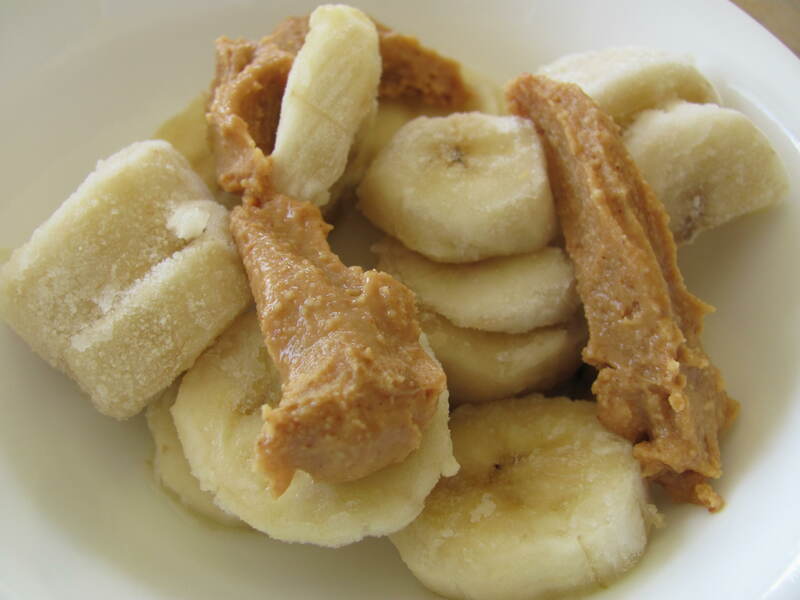 Frozen banana slices with 1 Tbsp. peanut butter. Today is the first day of Spring Break for us. I don’t exactly get a Spring Break since I am behind in my online classes. We have a pool and my brothers are swimming in it. Apparently the water is really warm! Gross. I want to go swimming in cool, refreshing water! I hope you all had a splendid Easter. Now that Easter is over, and all the candy is probably eaten, I wish to shed some light on the real reason we have Easter. I feel like Easter is one of the most precious and Holy holidays, but isn’t treated that way. Instead Easter is always cluttered with absolute nonsense. Easter baskets filled to the brim with brightly colored candy, chocolate bunnies and plastic eggs and gifts. There’s nothing wrong with those traditions, but they are petty compared to Christ’s sacrifice for us. I know a lot of people do incorporate Christ’s atonement and resurrection into the holiday, and I am glad. I want you to know that I know that Christ atoned and died for us. I know that He was resurrected and that He lives again. I’ve always been very visual and so I love this short video produced by my church – An Easter Declaration. What does Easter mean to you? What are your Easter traditions? Easter is my favorite religious holiday. It means a lot to my family, and we always go to church at midnight. Love that service! I hope you had a blessed Easter, girl! such a powerful video!thanks for reminding us all what Easter is about! Great post! I agree that it is so important to remember the reason for the season. It’s so easy to get caught up in the secular world of bunnies and candy and not focus on the incredible sacrifice Christ made for all of us. Usually, my family goes to Church not only on Easter Sunday but on the Thursday and Friday too where we commemorate the Last Super and Christ journey to the cross. You have a pool? What the heck, not far at all! Ooh, I couldn’t disagree more; I love swimming in super warm water! Easter to me, means spending time with you family and sharing a meaningful day with your loved ones. Obviously, it’s a very religious holiday, and we treat it like that (to an extent) but I guess we focus more on loving and family then we do actual Jesus Christ. Thanks for the pleasant reminder! Lovely video-I agree with Jenny! Frozen nanners and pb are my favorite girl! I freeze bananas ALL the time. I love putting them in my oats! We really don’t do a whole lot on Easter, but we make it a family day. YES! I totally agree! This holiday has turned from being a celebration of God welcoming us into his kingdom to somehow a magical rabbit that delivers candy to children. How did that happen? Haha. This is a beautiful post, Kayla. I love it! I totally agree with you.. Easter is so commercialized. That video is wonderful, and I’m extremely visual too. Haha. Thanks for the beautiful post! Easter .. along with every other holiday – have turned into ways for companies to make money. You brought everyone back down to what is real. PS… loving your frozen nana snackage! So true! I hate that the reason for the season of Easter is as lost as it is for Christmas! Since when did the corporate world own religious holidays too?! Great post and a great way to remind people what the day is really about!